Rawalpindi (راولپنڈی, Rawalpindi) is a city in the Potohar region of Pakistan in Punjab province near Pakistan’s capital city of Islamabad. The Rawalpindi/Islamabad metropolitan area is ranked the third highest in the country. Due to the high interdependence and intertwined areas of the two cities, they are known as the twin cities of Rawalpindi/Islamabad. 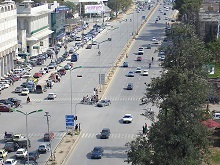 In the 1950s, Rawalpindi was smaller than Hyderabad and Multan, but the city’s economy received a boost during the building of Islamabad (1959–1969), during which time Rawalpindi served as the national capital and its population increased from 180,000 to over 2.1 million. Rawalpindi is the administrative seat of the Rawalpindi District. The total area of the city is approximately 154 square kilometres (59 sq mi). Rawalpindi is also the military headquarters of the Pakistani Armed Forces.